When the British Arean Company founded its Martian colony, it welcomed any settlers it could get. Outcasts, misfits, and dreamers emigrated in droves to undertake the grueling task of terraforming the cold red planet―only to be abandoned when the BAC discovered it couldn't turn a profit on Mars. This is the story of Mary Griffith, a determined woman with three daughters, who opened the only place to buy a beer on the Tharsis Bulge. 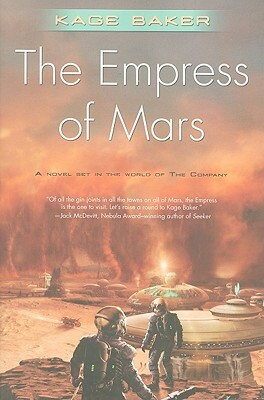 It's also the story of Manco Inca, whose attempt to terraform Mars brought a new goddess vividly to life; of Stanford Crosley, con man extraordinaire; of Ottorino Vespucci, space cowboy and romantic hero; of the Clan Morrigan; of the denizens of the Martian Motel, and of the machinations of another Company entirely; all of whom contribute to the downfall of the BAC and the founding of a new world. But Mary and her struggles and triumphs are at the center of it all, in her bar, the Empress of Mars.